About Eggs-> Why Eggs Are Good For You? Eggs contain protein which is needed for building and repairing the cells in muscles and other body tissues. Eggs supply valuable minerals and vitamins. Eggs contain vitamin A; all 8 of the B group vitamins as well as vitamin D and E.
Vitamins A, D and E are found only in the egg yolk. Most of the B group vitamins are both in the yolk and the white although the yolk has greater quantities. The most important mineral in eggs is iron and it's found in the yolk. The iron is absorbed best if food containing vitamin C is eaten at the same meal. Eggs also contain zinc, iodine, phosphorus, potassium and small quantities of other minerals. Eggs contain 5g of fat that is only found in the yolk. Eggs contain 190mg cholesterol that is only found in the yolk. 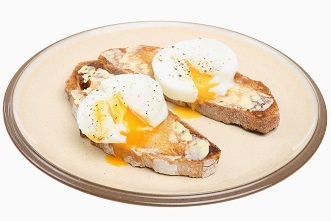 The egg yolk contains 60 calories and the egg white only 15 calories. Eggs are excellent for growing children. They provide nutritional variety; a high quality protein for growth, they help balance input and output of calories, while the importance of breakfast for good performance at school has also been demonstrated. High quality protein is essential for muscle growth in response to exercise, and to counter sarcopenia (age-related loss of skeletal muscle mass), while older people need a high quality, low fat protein. Eggs are the least expensive source of high quality protein. They are also easy to cook, chew and digest. decreases cell death and life-long changes in nerve growth factors and calretinin. Feeding egg yolks to infants of six months and older provides a valuable source of iron. Teenage girls who regularly eat eggs are less likely to develop breast cancer later in life.